Have you ever wished you could have just one small portion of chocolate cake to help satisfy a craving? 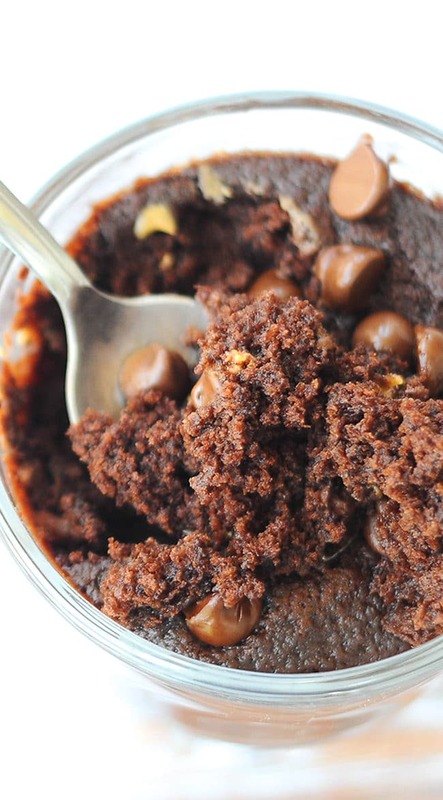 If so, this double chocolate peanut butter mug cake recipe will be right up your alley. 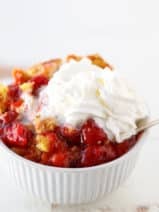 It’s super easy to make, and if you aren’t already a fan of mug cake recipes made in the microwave, you’re sure to be a convert! 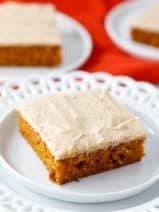 I will tell you that this is a pretty decadent sweet treat, but since it’s a small portion, you don’t have to feel too guilty! Because it’s eggless, you can even take a bite of the batter before putting your chocolate peanut butter mug cake in the microwave to cook. This chocolate mug cake recipe features a warm, gooey dollop of peanut butter in the center of the cake and a sprinkling of sweet melty milk chocolate chips on top. Making mug cakes in the microwave is actually kind of fun, easy, and of course, you get the pleasure of devouring that delicious little mug cake after just a few minutes of prep and cook time! 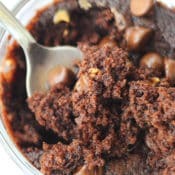 This mug cake recipe is adapted just a little from a chocolate peanut butter mug cake recipe that I found The Novice Chef blog a very long time ago. The great thing about mug cake recipes is how many ways you can vary the recipe to suit your preferences. Don’t like peanut butter? Skip that part. Want to cut down on the sugar? Add a little less—it will still taste great. Want to put this double chocolate peanut butter mug cake completely and totally over the top? 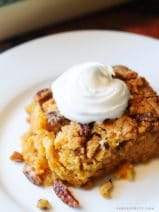 Add a glob of vanilla ice cream to the top when it comes out of the microwave. I’m getting hungry just thinking about that. 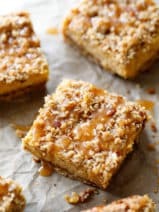 If you’re a peanut butter junkie like me, don’t forget to check out our tasty peanut butter pie recipe and these easy peanut butter no-bake cookies! 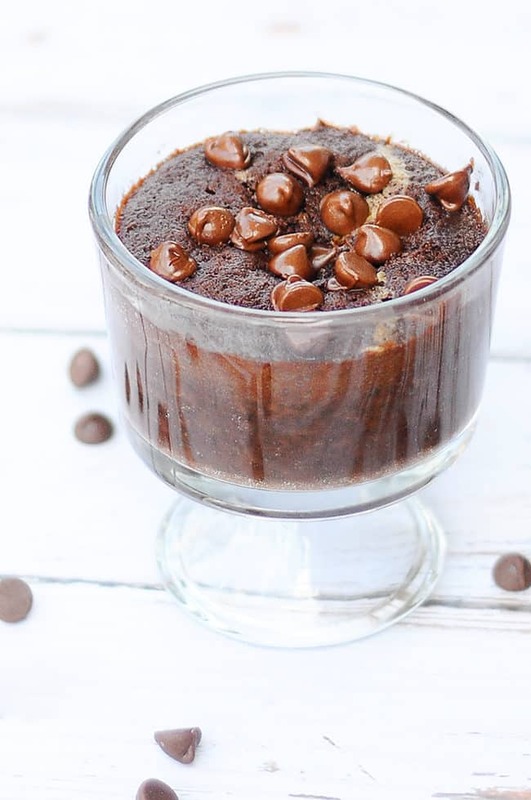 I hope you enjoy this yummy double chocolate peanut butter mug cake recipe as much as I did! Add flour, sugar, cocoa powder, baking powder and salt to a mug, mix well. Add milk and vegetable oil, stir until smooth. Drop peanut butter on top of mixture and gently push into center leaving some exposed on the top. Cook in microwave on high for approx. 1 minute in 1200 watt microwave, add sprinkling of milk chocolate chips immediately after cooking. Recipe adapted from The Novice Chef. 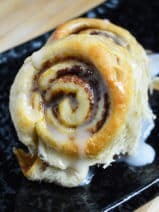 3 tbsp flour, 2 tbsp cocoa powder, 1/4 tsp baking powder, 2 tbsp unsweetened applesauce, 3 tbsp water, 1/2 tsp vanilla, 10 chocolate chips, 1 tbsp peanut butter. Mix all the items together, microwave for 1 minute.